Elabram Systems Group, the preferred engineering manpower service provider in the world with solutions from Talent Acquisition & Deployment (TAD), Business Process Outsourcing (BPO), Knowledge Process Outsourcing (KPO) and Network Planning & Optimization (NPO) with offices in Indonesia, Thailand, Singapore, Philippines and Malaysia is one of the finalists under Technology Company of the Year category at Asia CEO Awards where according to its organizer is the biggest gathering of business leaders in Asia. Award winning entrepreneur from Malaysia and Indonesia, Mikel Yaw is the CEO of Elabram Systems Group. 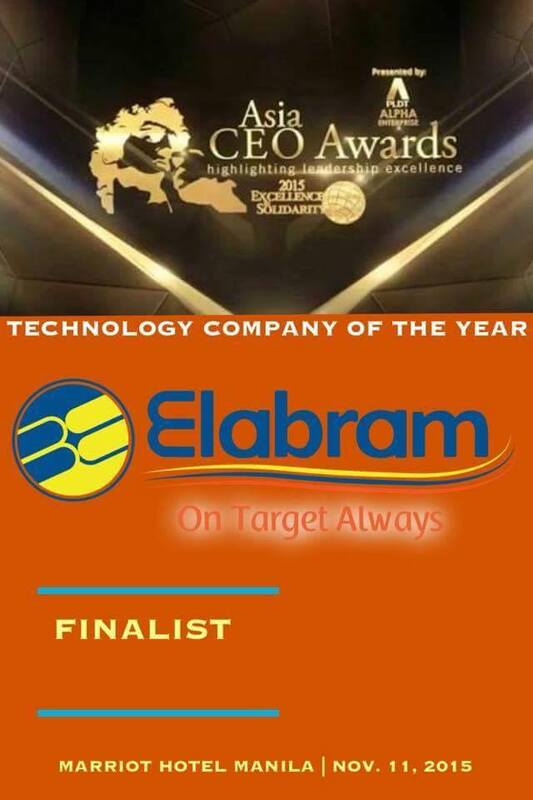 He won multiple awards already; Fast Moving Companies Award- Golden Bull, Entrepreneur of the Year- Enterprise Asia and Outstanding Award of the Year in Indonesia- Asia Pacific Entrepreneurship, and yet still overwhelmed of the distinction since aside from receiving citations in the Philippines from different award giving bodies, this is the first time that Elabram Systems Group is considered against different industries like BPO (Accenture, 24/7), Finance (CreditBPO Tech), Information Technology (Tata Consultancy) and Human Resources (Freelance.com). According to Marketing and Branding Head of Elabram Systems, Engr. Grace Bondad Nicolas, "We are expanding our expertise from Telecommunications to FMCG, Mining, Information Technology and Digital. When KPMG sent a confirmation letter that were one of the finalists under "Technology Company of the Year" based on the financial capacity, impact in the global market and manpower skills, even with the multiple awards received already, were still excited because we always strive more to be known based on our skills and this platform will help us to reach more of our target clients since the awards night will be attended by leaders from different organizations on November 11, 2015 at Marriot Hotel, Manila. Our team of directors from the Finance Department and Talent Acquisition & Deployment will be with us to celebrate this momentous event at the Gala night." Elabram Systems Group is 6000 strong globally. For more information, contact mariagracia.n@elabram.com or check the website at http://www.elabram.com. The company is hiring 200 manpower weekly for the biggest organizations in the world. Start a rewarding career at Elabram! Welcome Baby Maria Letizia Dantes! Papa John's Pizza, A fresher way to enjoy pizza! #ContestAlert! 40 gadgets to 40 students! Why join First Time Moms PH community? Flash Giveaway! Who wants a movie date? How do I make money with Clixsense? A brand New Car can be Yours!